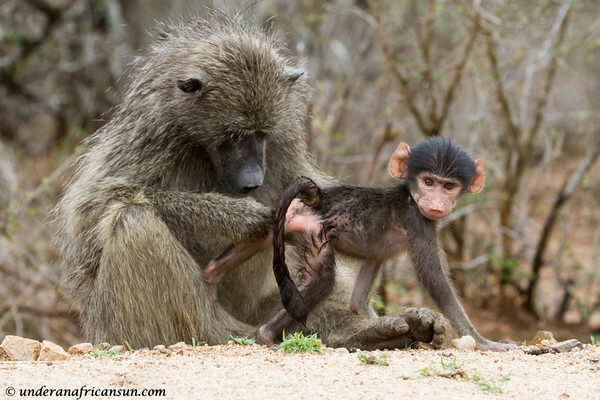 A big event in November is the birth of thousands of impala lambs. I arrived Nov 13th, which is normally right about in the middle of the birthing season. This year, due to the lack of rain, the lambs were late to arrive.You could see the ewes were ready to pop and I jokingly would stop and ask them where the babies were. 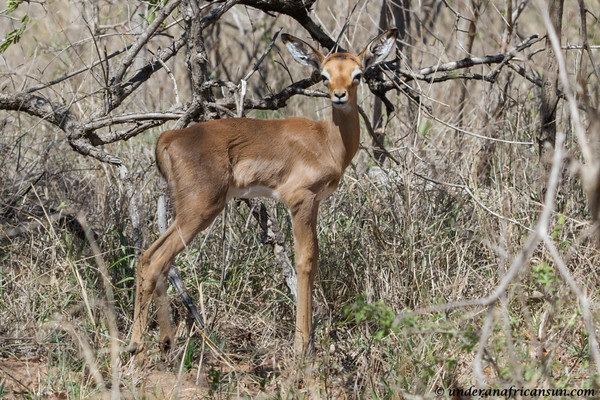 I eventually saw my first and only baby impala on Nov 20th. 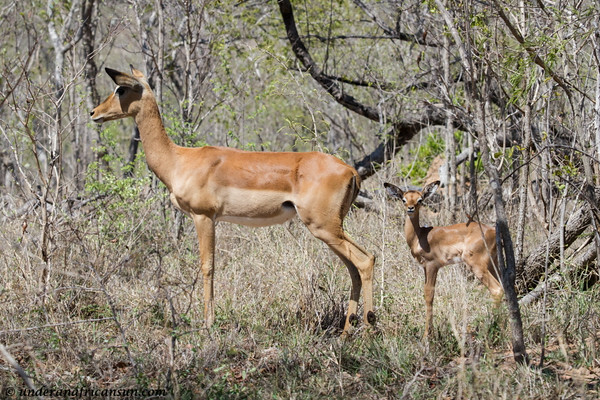 Impala ewes go away from the herd to give birth alone. 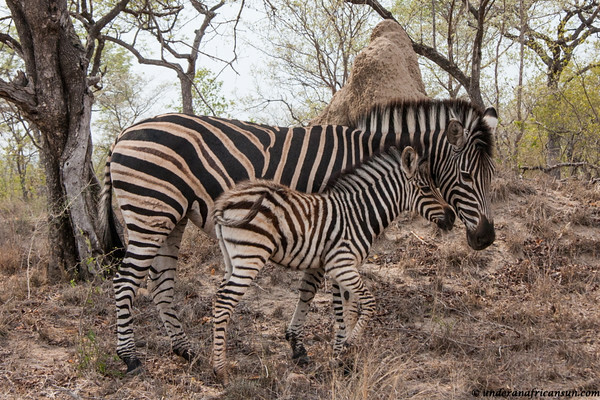 This mom seemed a bit nervous about something unseen in the bush. 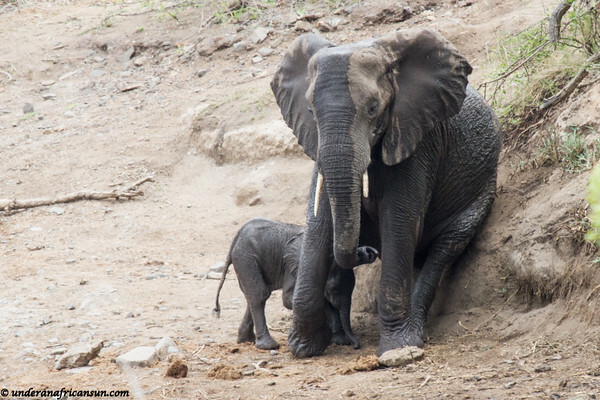 I saw many large breeding herds of elephants with babies of all sizes. 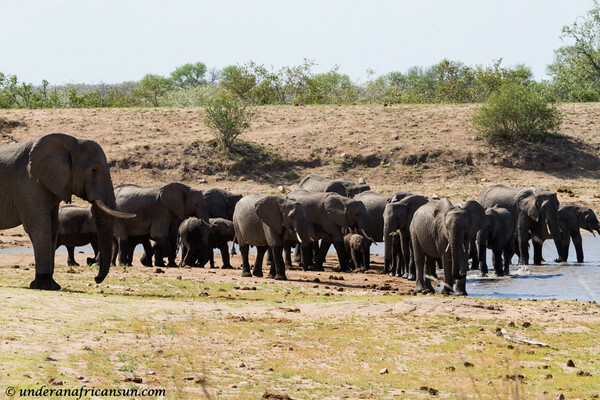 In times of water shortages (like now) smaller herds will sometimes come together in search of water. 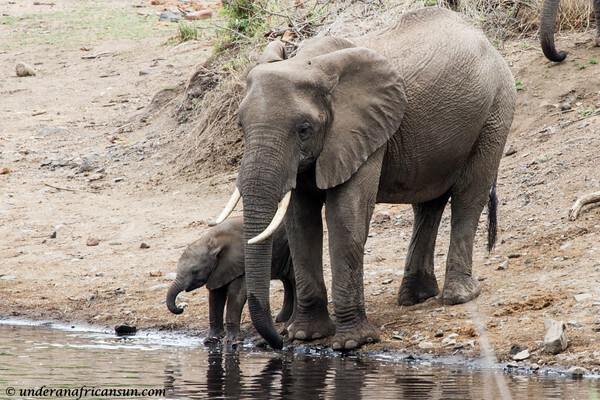 Watching these impressive creatures drinking and playing together is sight to behold. 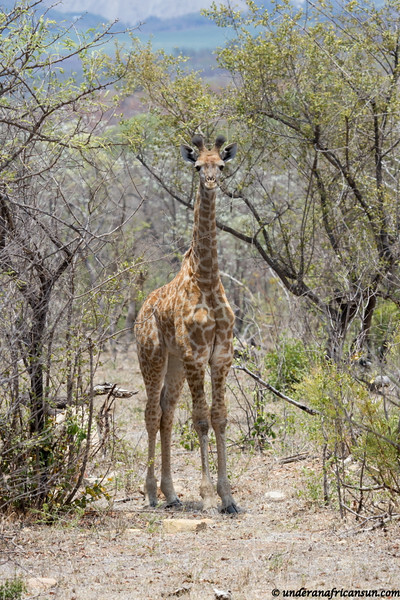 Baby giraffes are called calves. 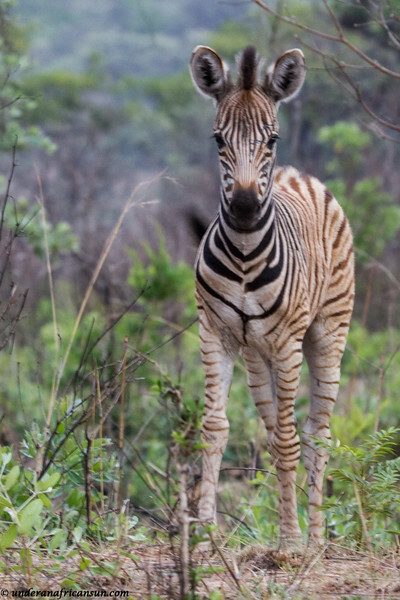 This youngster was hanging out with a herd of impala and the nearest giraffes I found were over 1 km away. I hope he found his mommy. 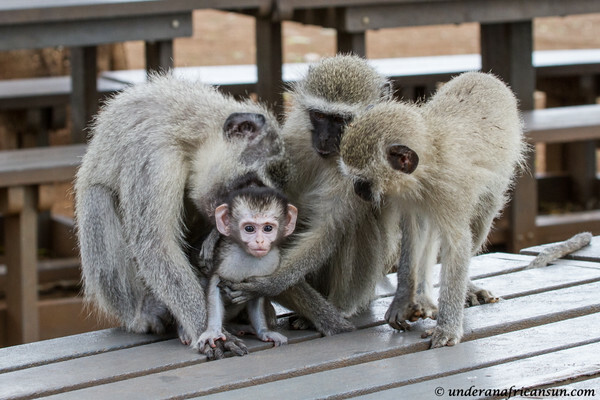 Watching vervet monkeys is one of my favorite things to do on safari. 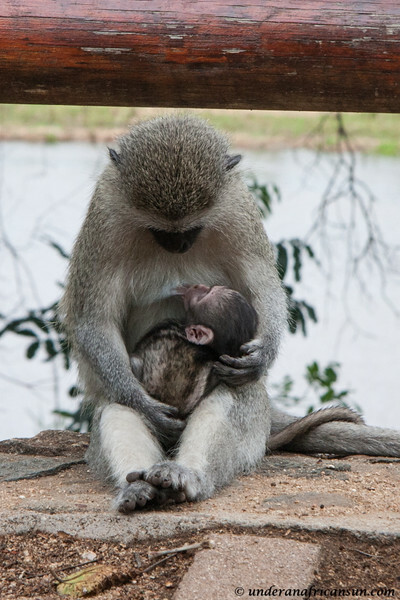 Their actions and expressions are so human-like and I especially love to watch the moms with their little ones. 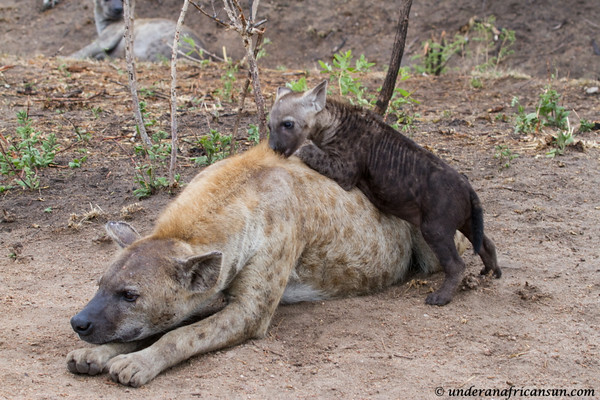 One morning I came across a large hyena clan with cubs (yes they are more closely related to the cat family) of all sizes running and playing together. 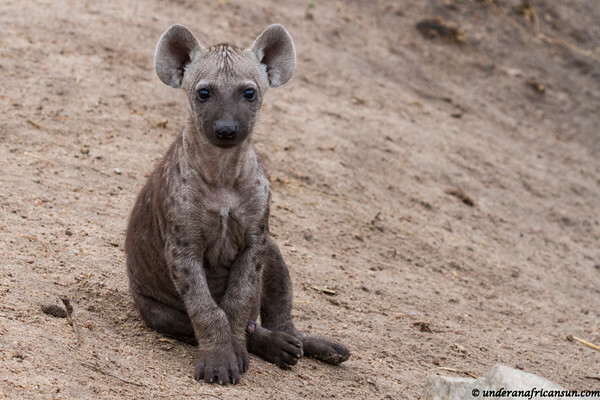 I’ll never understand why hyenas are disliked by so many people, I find them fascinating. 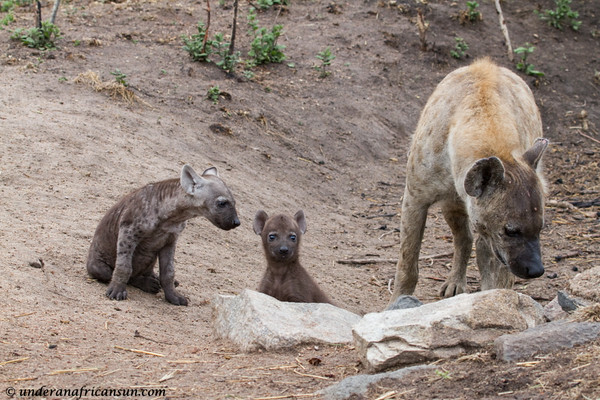 The smallest cubs were still in the den but this one in the middle came out briefly to have a look at the world. 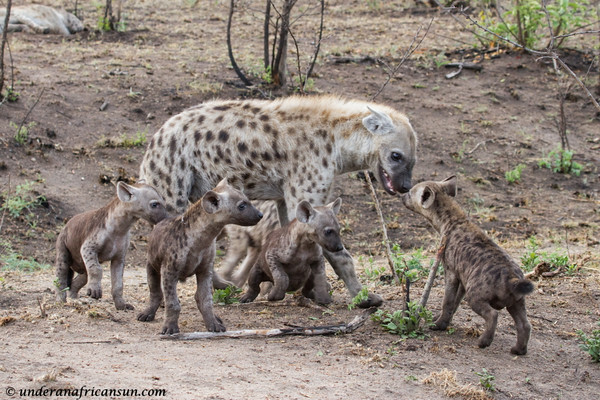 These cubs were quite rambunctious and mom had to calm things down a bit. 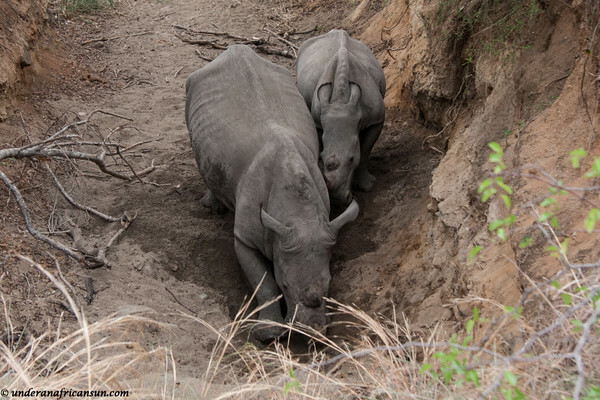 This rhino cow seemed to be trying to dig her way under the road and her calf was whimpering, not sure what was going on here. 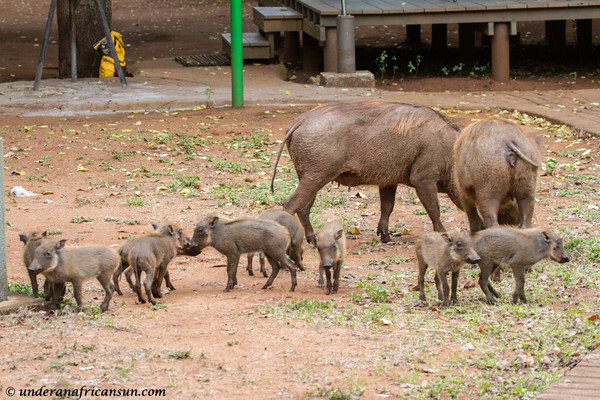 Warthogs are an animal that many people consider ugly, or at best, having a face only a mother could love. 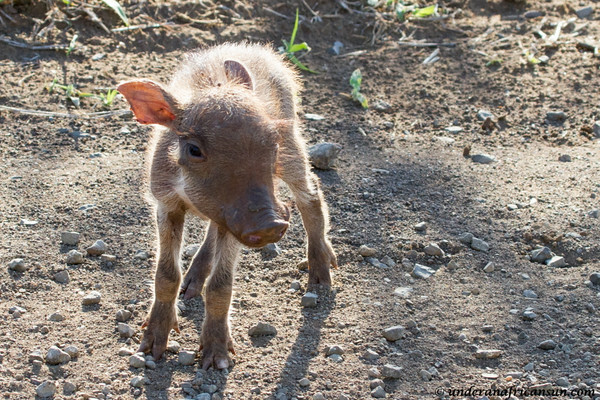 But how can you not love these little piglets? 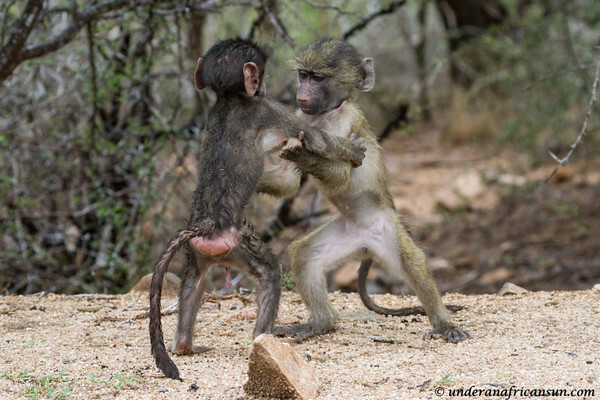 Baboons are never lacking in entertainment value and the babies are oh so cute. 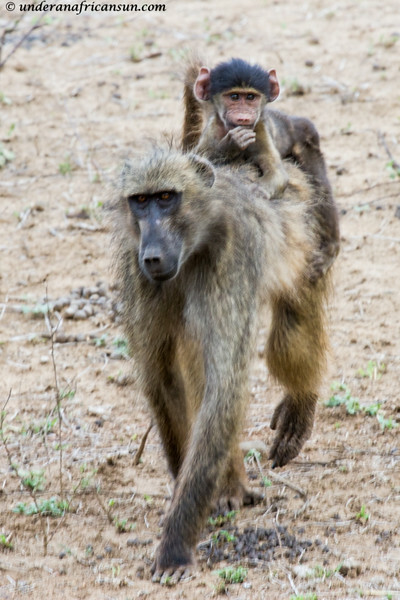 I could sit and watch a troop and their antics for hours. And let’s not forget the birds. 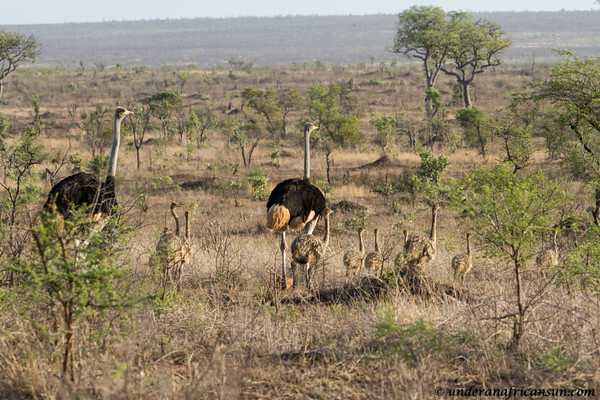 Ostrich chicks. 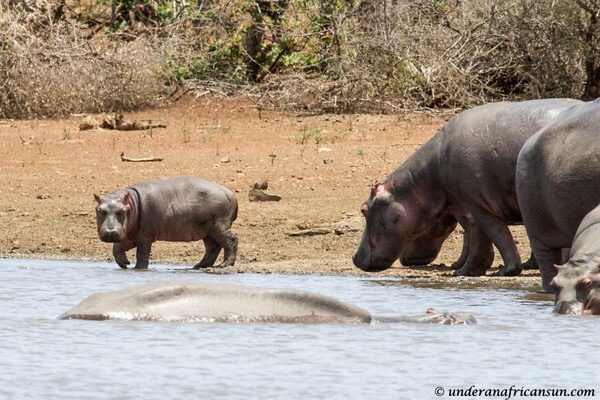 The 2 males are watching over the chicks while the 2 ladies are chatting out of the range of the photo. 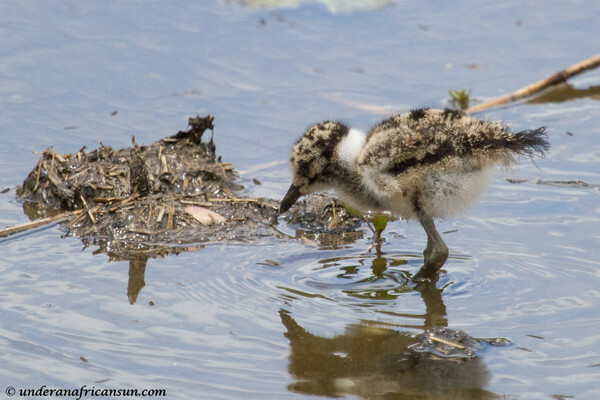 First time I have ever seen chicks, so adorable. I saved one of my favorite sightings for last. 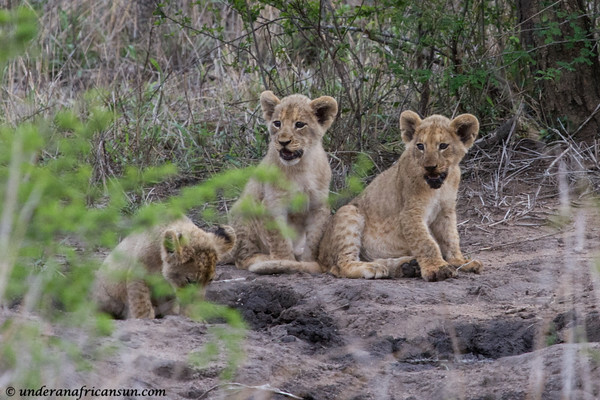 Lions cubs with a buffalo kill ! This is a story waiting to be told in its own post so stay tuned. 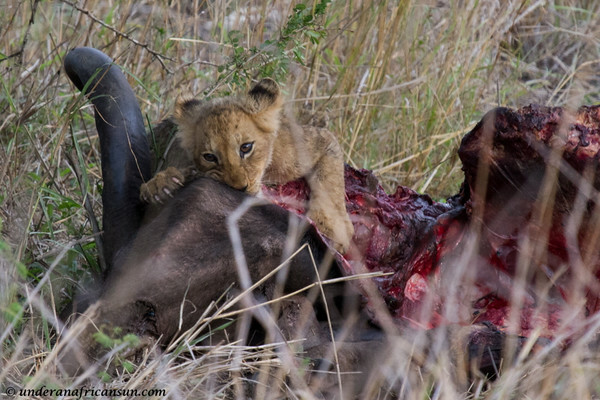 Lion cub feeding on a buffalo kill. 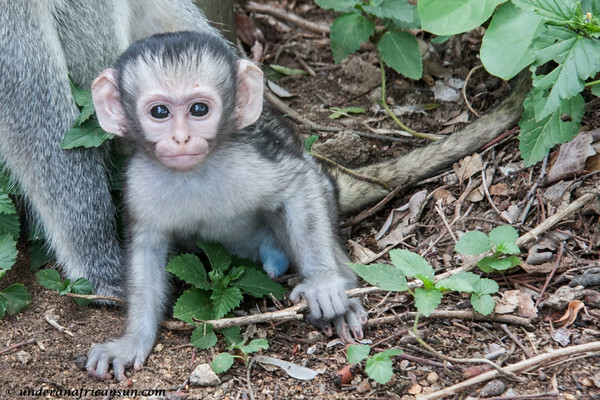 Look at those claws ! 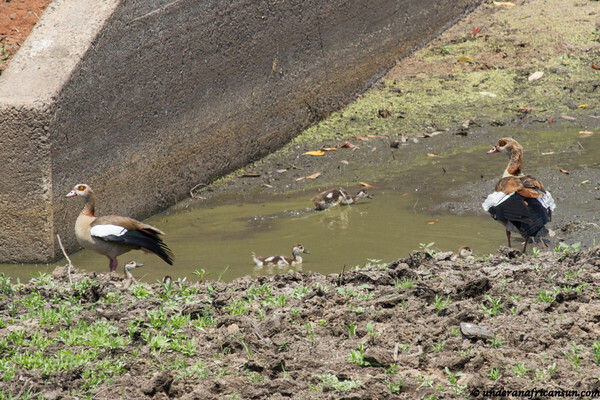 This entry was posted in Bird Life, Safari, South Africa, Wildlife and tagged Birds, Kruger, Nature, Reserves, Safari, South Africa, Wildlife by UnderAnAfricanSun. Bookmark the permalink.